I am fascinated by the printed image and the many possibilities printmaking offers to create and to reproduce an image. It has been an area I have been exploring since I left teaching art in secondary schools. Over my art teaching career I have taught so many creative art subjects but print making was never fully explored. The purchase of a small printing press started an exciting exploration, one with endless possibilities and one that never ceases to motivate and inspire me. 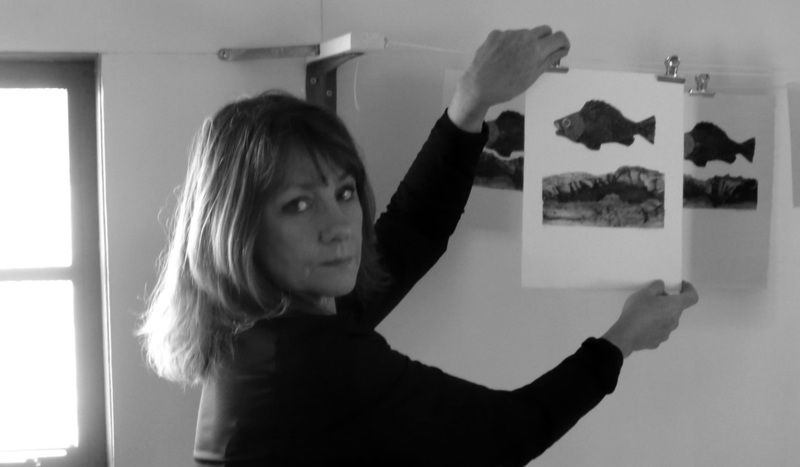 I have developed a body of work over the last seven years using Lino cut, Intaglio/Dry point, Monotype and Collagraph methods and I have used reduction, multi plate, hand colouring, "chine colle" and "a la poupee" inking and printing techniques. I have attended many workshops & exhibitions, read reference books and watched You Tube segments in my thirst for information. I am influenced by many print makers from the past and present and I am especially inspired by printmaking colleagues, Rosemary Eagle, Vida Pearson and the ecclectic group of printmakers in the Goldfields Printmakers group. English Collagraph printmaker, Brenda Hartill is a constant inspiration. I was fortunate to meet her and hear her talk in Bendigo and I viewed her beautiful prints up close in early 2013. I conduct various printmaking workshops to children and adults. My small press is transportable. My waterbased inks and printing processes are enviromentally safe. I have a wonderful studio, built by Andy, my supportive husband. It has two rooms... a general art area and another room devoted exclusively to printmaking. 2014 Two Animalia prints Archived in The Canberra National Gallery. 2014 Goldfields Printmakers Exhibition Oct.1st-18th FireStation Print Studio Armadale. 2012 Print Council of Australia facebook "Print of the Week" award. Teaching Methods - Visual Art, Ceramics, Media, Photography, Graphic Communication, Textiles, Art history & junior general history. Education week sessions Ararat Art Gallery - Print making, Painting meets Digital Art Photoshop, Drawing.